I woke this morning to a couple of centimeters of snow. Part of me was mildly outraged that snow should fall so late in the seasons. Snow may be continuing to fall in places like Calgary and Saskatoon, where they’re still experiencing lows of -20 or greater, but I’ve been running in shorts since New Years, and was starting to expect the first signs of spring in two or three weeks. Still, like most weather extremes in Vancouver, the snow is unlikely to stay for more than a few days. Meanwhile, this morning, it was enough of a novelty that I could enjoy the experience of an early morning run through it. Speed, of course, is totally lost in the snow, especially when it covers a thin layer of ice, like this morning’s did. So, frequently, is balance and dignity – I fell twice this morning, although, with the feeling of an unexpected holiday that comes with snow in Vancouver, I took both with surprisingly good humor. But I was in no hurry, and slogged along, my ankles getting as much of an extra workout as they would have if I was running over sand. The worst moments were crossing the roads, where the few cars on the road had stripped the layer of snow and left only black ice. I tiptoed with exaggerate caution over the intersections, arms spread low for balance and head high so that I could check for cars. I’ve always enjoyed the sensation of being the only person stirring on a morning run, but the snow adds substantially to that feeling. True, even at sunrise, the tracks in the snow indicated once or twice that I was not the first person stirring. Yet for long stretches, mine were the first footprints in the snow. And even where I could see the signs of others, the sound-muting qualities of the snow were in force, and the quiet intensified the sense of solitude. Literally, too, I was one of the first stirring, with no more than a single car passing every kilometer. I didn’t experience, as I have in other snowfalls, being the fastest thing on the road. This year, Vancouver has had enough snowfalls that most people were prepared for driving in the snow. However, the snowfall intensified before I had finished half my run, so I had a good twenty minutes of feeling that I was falling into an endless well of snow flakes. Then came the welcome relief of a hot bath and dry clothes – to say nothing of the rosy glow of virtue that comes from finishing something difficult and mildly against my inclinations. My friend Bob Ley has been an art collector as long as I’ve known him. The office where he practices psychology is carefully decorated with unique paintings and antiques – mostly modernist, with a tendency to primitivism and abstracts, but all of them a welcome change from the endless reprints of 19th century impressionists or the bland corporate art visible elsewhere. “I’ll never understand why my friends will pay $100 for a print of Van Gogh’s Sunflowers and then another $400 for the frame,” he says, “When for the same price they could get an original work of art.” After my purchase of a custom West Coast bracelet a couple of weeks ago, I know what he means. Buying original art may be expensive, but it’s also very satisfying. For one thing, in West Coast art, at least, it means experiencing another level of quality. 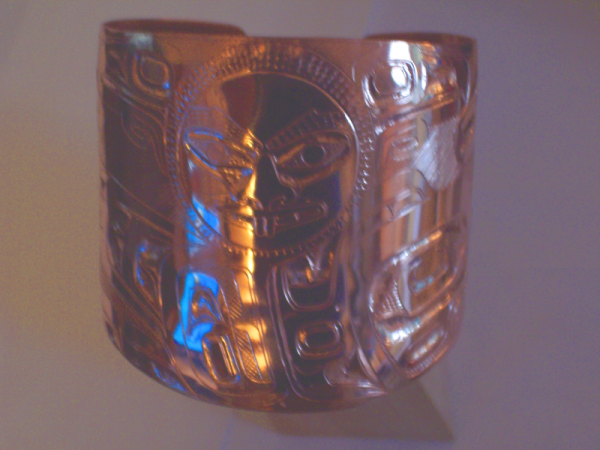 I’ve long been aware of the vast difference in quality between the bracelets and masks in tourist shops in Vancouver and the true art galleries; you don’t need the price difference to see the difference in quality. But when you enter the world of custom art, you discover a new standard altogether. It’s not that the art galleries are full of shoddy work, or that you can’t find quality pieces in the tourist shops if you search carefully. Rather, there’s a freshness in custom work that you don’t usually see in designs knocked off for the tourist shops, or even for limited editions. Custom work tends to engage the artist in ways that other work doesn’t, simply because it’s unique. For another, when you commission an original piece of art, you experience the pleasure of being a patron. Besides the beauty of the piece itself, you have the pleasure of knowing that, if not for you, the piece wouldn’t have come into existence. The artist, of course, is the primary creator, but, as patron, you have a minor secondary role. On a small scale, you can glimpse why Lorenzo de’ Medici was such an enthusiastic supporter of artists. Even more importantly, you can view new art with a clean eye, in a way that’s rarely possible with works firmly enshrined in the canons of great art. Short of a radical step such as the cleaning of the Sistine Chapel’s ceiling, I doubt that anyone can appreciate works from the high renaissance like da Vinci’s Mona Lisa in the same way that people in the sixteenth century could. We’ve not only seen these works too often, but we’ve been told too often what to think of them. While some appreciation can be gained by seeing such works in person as opposed to in a print or an illustration, for the most part we’ve lost the power to see these works for themselves. With newer, less familiar works, we can still see the accomplishment for themselves. This ability is important, because living with art enriches and relaxes us. A room designed by an architect of genius is simply a comfortable place to live or work, although many people would be hard-pressed to notice or tell you why. A room decorated with art that you can still see with fresh eyes has much the same effect. Both are at the opposite end of the spectrum from public institutions with deliberately mediocre art. What’s more, such rooms become more comfortable as people spent more time relaxed in them; the way we use room really can create an impression or aura that we can respond to (which is why I don’t frequent the coffee shop in the old gatehouse of the BC Penitentiary – there’s been too much misery, however justified, in the place for it ever to be a place I’d care to linger). In the same way, with my new bracelet, I walk a little straighter and my stride has a bit more of a bounce because I am always aware of its weight on my arm, and the way it catches the light. Moreover – even better than an artistic room or a room full of art – I carry the bracelet with me, and can enjoy a closer look at the design whenever I want. That, really, is the ultimate pleasure in commissioning a new piece of art for yourself: You not only have a unique relation to it, but your life is broadened by an appreciation of something breathtaking and new. Most articles about reducing stress in the workplace start with the assumption that you can do something to affect your circumstances. But unless you’re a company officer or director, you probably can’t do very much. You’re subject to the whims and cluelessness of the upper echelons, and the company’s main concern is usually to squeeze the most work out of you for the least amount of renumeration — and that means too much work to do, unpaid overtime, and most of the other immediate sources of stress. At times, you may be tempted to beat yourself senseless, or even chew a leg off to escape these conditions. However, I have to warn you that the last one especially can ruin your chances of doing that half marathon you’ve always dreamed about. Besides, you will still need money, and a handicap pension isn’t enough for anyone to live on. Employers may dangle benefits before you in the hopes of enticing you to become a full-time employee. And, at first, you might be lured into agreeing for the sake of security. But, as I like to say, the main difference between contract and full-time work is that, as a contractor, you know when your job ends. You may even have a kill clause in your contract. By contrast, full-time employment can end without warning or any more compensation than required by local laws. The ugly truth that nobody likes to mention is that full-time employment is not much more secure than consulting. It also dulls your instincts for survival besides, so that layoffs hit you harder. Consultants know they can survive, because they’ve done so before. Another big advantage of being a contractor is that you’re usually paid by the hour. That means that managers think twice about asking you to stay late, and that, when you do, you’re being paid — unlike everyone around you. You may still have to put in long hours, but at least you’re receiving hardship pay. The most productive and fulfilled people at most companies are those who are actually building the products that the company sells — the computer programmers, graphic designers, and other manufacturers. But somewhere about midway up the management hierarchy, employment stops being about productivity and starts being about ego. That means that, the more remote managers and directors are from what the company sells, the more likely than an encounter with them will be about making them feel good, and not about helping you with any problems. You may be flattered if such people ask you for details about your work — but, believe me, they won’t remember. They’re not asking because they want to learn more and do their jobs better. Most of the time, they’re looking for a way to kill time. Granted, you might get some wicked stories to tell your co-workers about their ignorance, but that’s a poor return for the time you’ve lost. Meetings are for those who have reached exalted positions where they are no longer productive. If you haven’t reached that stage, the average meeting will simply cut into your already too-short work time. Should anything important actually happen at a meeting, you can always read about it when the minutes are circulated in an email. True, by missing meetings, you miss free food. But donuts and other typical meeting fodder only give you a sugar rush to leave you all the more attenuated after you come down. That process is a physical stress in itself. Career experts tell you that company events are a way to network. In fact, they’re a way for human resources managers to look busy (see #2). For others, they are an annoying interruption in a busy day. So, even though you’re dying for an excuse to knock off work, remember that what you’ll be doing is playing ring-toss in the hall or dressing up in a clown suit, and that embarassment is a form of stress in itself. If you’re shy, you’ll suffer agonies, and ditto if you have any empathy at all. Rather than attending a function, book off sick or claim an important task is waiting. Schedule a root canal for the time of the function. If all else fails, duck out early. Eating in a cafeteria — or, even worse, at your desk — only means that people can find you more easily and dump work on you, adding to your stress. Even if someone just want to ask you a question, you’re losing time that belongs to you. Instead of making yourself a target, go out and remind yourself that there’s a world beyond work. Remembering this fact is one of the most reliable ways to put the pressures of work into perspective. But be sure to vary your walking routes or restaurant, or somebody might still be able to find you. If you’re feeling stressed because of your workload, the last thing you should do is take on extra work, no matter how good you think volunteering will make you look. This advice especially applies to taking work home on evenings or weekends. Contrary to what the brainwashed and the ambitious believe, such volunteering rarely helps you get ahead. But it is almost guaranteed to age you prematurely. Even worse, it frequently means you are compensating for the fact that there’s too few staff members, and enabling management to dodge the problem. Anyway, unless there’s a genuine crisis, you won’t have cleared your To Do list — you’ll simply have removed some items so that they can be replaced by new ones. Unless your company is heavily overstaffed, there’s always more work to do, and, for a surprising amount of it, whether you do it today or tomorrow doesn’t matter very much. The official myth in our society is that hard work is rewarded with promotion. That’s true in a handful of first-rate companies, but, in most work places, the better you are in your position, the harder time people have of imagining you in another one. I’m not saying that you should slack off — after all, presumably you need the money, and losing your self-respect will only add to your stress. But if you insist on working hard, make sure that it’s for your own reasons and not for any expectation of reward. The chances are overwhelming that you won’t get one. You’ll notice that none of these steps actually involve your workflow or work habits. That’s because stress at work is rarely about the work itself, so much as the conditions that surround it. In other words, getting organized, disciplining your email reading habits or any of the usual suggestions you get won’t do much for you. Instead, recognize that you may be in an impossible position, and that the problem is just as likely to be in what’s around you than in you or your habits. And if that sounds cynical, reflect that, in a bad situation, cynicism is not a negative trait, but a successful survival mechanism. In this case, knowing why a situation is stressful can sometimes help you feel less stressed. And if the situation continues, or gets worse, remember that sometimes the best way of dealing with stress is to move on. Just looking for work can help you endure your present situation a while longer (so long, of course, as you don’t let your managers know that you’re looking for work by slipping up and leaving your resume by the copier or by taking long phone calls with recruiters at work). Rather than enduring stress because you’re afraid of the unknown, have the courage to actively look for alternatives. If you’re like most full-timers, you’ll probably find that finding new employment is easier than you feared. When you are learning to write, your teachers usually blame you for any failure of communication. Considering that you are learning the craft, the assumption is often accurate. The only trouble is, you end up believing unconsciously that, if you find just the right words, you can communicate perfectly, and never be misunderstood. But, if you keep writing, and receive enough responses, you start to appreciate that, not only is perfect communication impossible, but that the baggage your audience lugs along can be just as important as what you say and how you say it. The trick, of course, is to know who is responsible for any particular breakdown in communication. Teachers, incidentally, experience the same revelation – or, at least, I did. When I first stepped in front of a class, I imagined that I fully controlled the experience. As a result, my first semester teaching post-secondary was almost my last. I needed to learn that, while some students wanted to learn, I needed to cajole or entertain others before they would even try to absorb my lesson. Still others were either not willing or perhaps not ready to learn, or couldn’t learn from me. Even when, cured of illusions, I received consistently high evaluations from students, beyond a certain point, I couldn’t make everybody in a class learn. All I could do was provide an opportunity to learn, and tempt students to take advantage of it. To say the least, the revelation was humbling. At times, it was profoundly discouraging, too. In the same way, the most you can do as a writer is your best. You can articulate original or insightful ideas, choose your words carefully, and structure your thoughts in a way that would make Aristotle proud – and still, how readers receive your words will be dependent to some degree on what they bring to the experience. If anything, the possibility of not engaging your audience is even greater than with teaching, because you’re generally not face-to-face with your readers, so you can’t adjust your words to entice them better. No matter how careful you are, some readers will dislike what you have to say because your topic is personally painful because of a trauma they experienced when they were four years old. Others will criticize you because you’ve written a commentary instead of an essay that proves your argument point by laborious point. Some will object because of what they think you said, but didn’t. Given half a chance, some will try to pick a fight with you if you’re accessible. The careless will misread what you say, take a phrase out of context, or in their minds transform what you said into something altogether different. the humor-impaired will miss your jokes. The paranoid will think you’re talking about them. Even when you’re praised, the experience can be just as devastating. People will praise you because you are echoing something their much beloved great-aunt used to say, or because your throwaway phrase gave them the courage to leave their boyfriend. They’ll find a wisdom you didn’t intend, and make you feel stupid compared to the clever person they imagine you to be. They’ll praise an accident in your phasing, and ignore the parts you meant to be witty. And so it goes, each time you publish, until at times you’ll wonder how humans ever communicate. The important thing to remember is that, as group therapy leaders are supposed to say, this isn’t about you. Or, not necessarily. You can never completely ignore what people have to say because at times, impartially-speaking, some of the ways that people misinterpret actually do point to a flaw in your work – especially if a majority make the same misinterpretation. But, at the same time, you can’t always give reader reactions undue weight, either. Often, the reactions will be based on nothing that you control. All you can do is write with what Balzac called “clean hands and composure,” absorb what is useful for improving your craft from the reactions, ignore the rest – both the good and the bad – and try to do better next time. A few years ago, the mechanics of business networking were simple. You attended an event – a cocktail party, or perhaps a seminar – and circulated like mad, collecting business cards. All that is still an important part of networking, but, thanks to the social Internet (AKA Web 2.0), it’s just the beginning. This awareness has been growing in me for over a year, but I only became fully aware of this change last Saturday, when I dropped in at the end of the documentation camp for Joomla! that Rastin Mehr had organized in Vancouver. Like many of those at the event, Rastin is a computer consultant, and he quite frankly saw the event as a change to socialize with his associates. But was what was interesting to me was how he – and everyone else — went about it. One of Rastin’s vocations is photography, so he took dozens of shots of the event, and immediately posted some of them to Flickr, the photo-sharing site. Naturally, many of those at the event logged on for a look, either at the event – since most people were carrying laptops – or in the next few days afterwards. Some made comments, and Rastin provided links on FaceBook. (He also took some videos using the built-in webcam on his laptop, which has the effect of showing everyone at their foreshortened worse as they peer up at the lens). Meanwhile, several attendees blogged about the event, including Rastin and Monica Hamburg. Rastin’s blog was especially interesting as a form of networking, since he included his pictures of everyone, and wrote short biographies about those depicted (mine, which accompanied a picture that caught me with my eyes open, described my new West Coast bracelet as a chronoplate and me as a kind of journalistic Doctor Who – a comparison that delighted me, since I’ve been a fan of the regenerating Doctor for years). Naturally, people commented on those, too. Jeanette Duguay did something of the same, borrowing a picture from Rastin to illustrate her blog. People at other Joomla! doc camps also logged in, extending the networking to those who not only weren’t at the event, but who lived on other continents. (Now, of course, I’m doing something of the same, writing about these blogs and linking to them – although not, in my case, with pictures). As I write, Rastin has yet to post his video interviews, but I imagine that they will provide the same opportunities for continued interactions among the attendees. And, as if the blogs weren’t enough, instead of dropping the business cards they had collected into a pile destined to be forgotten in a corner, people took those cards and made LinkedIn and FaceBook connections with them. Connections on such sites are sometimes dismissed as shallow – and many times rightly so – but they do have the advantage over business cards of keeping people automatically in touch, providing that they login semi-regularly. In short, what social sites have done is to extend this networking event long past the hours in which it was held. Moreover, while they have provided ways to follow up on the encounters and perpetuate them. Whether in the long run they will help to make the connection more meaningful I can’t tell yet, but they certainly have created a better chance of lasting connections. Most social network sites, of course, were developed for teenagers and young adults as an extension of their leisure time. They still serve that function, and probably always well. All the same, seeing how working professionals are using them, I can’t help thinking that the social sites have proved themselves at last Far from being frivolous, as mainstream dilettantes are always maintaining, they’re becoming ways to enhance the power of networking. If you’re a professional seeking contacts, a FaceBook account is now as important as being decently dressed. And what you lose in straight forwardness, you gain in effective networking. Freud suggests that a feeling of the uncanny (or unheimlich, as he calls it) is a momentary reversion to a child-like perception of the world as vast, mysterious, and beyond your control. I can speak for anyone else, but, in my case, the observation is correct. Two of my strongest early memories are so imbued with the uncanny that they may explain my lifelong interest in fantasy and science fiction. In the first, I run out the door of my parents’ house, and descend the upper lawn. I am about to jump off the low stone wall to the lower lawn when I see a huge green and black snake coiled in the grass at my feet. Its body is about four inches thick, and it is slowly raising its head. I start giving it childish insults, calling it, “Sucker” and worse. Its forked tongue starts flicking in and out. For a moment, I am absolutely paralyzed. I think of leaping over it, but I don’t want it behind me in the grass. Finally, I turn around and race back inside. A while later, my family walks down to the car. I am careful to keep my eye on the grass as I go down the walkway, but I see nothing. In the second, I am walking along the hallway of my parents’ house. I turn the corner, and Captain Hook from Peter Pan is there. He wears a black frock coat, and is well over six feet tall. I can see a bandoleer of bullets and a sword at his side, and he is brandishing a silver hook the size of his head. He shouts and starts advancing towards me. I give a great shout of my own, and my parents come running, but he is already gone. Needless to say, Vancouver simply doesn’t have such large snakes, and people didn’t keep snakes as pets those days. Nor have I ever found a snake that matches the description of the one I remember. As for Captain Hook – well, I hardly need to explain the unlikelihood of anyone or anything in my childhood home being mistaken for such a figure. Both memories are undoubtedly of dreams, perhaps combined with sleepwalking. Undoubtedly, too, I have embellished them as the years went on, and I developed an even greater imagination. Yet that’s not how either one feels. Intellectually, I can explain the memories away. But, deep down where the instincts and nightmares dwell, I know that they happened exactly as I’ve described. To this day, a coiled snake makes me profoundly uneasy, although a snake in any other position doesn’t bother me and I have even handled some. Nor can I suppress a sudden tightness in my chest when I see Captain Hook portrayed in either animated or live action. In fact Dustin Hoffman in Pan made me faintly but definitely uneasy. I wonder, too, what could have provoked such dreams. I’ve looked in the books I was read as a child, and none of them are likely sources of either memory. Could I have seen something on TV? I doubt I could have made them up entirely on my own, and my inmost conviction remains that I didn’t: I saw them because they were there. No wonder that, when I read The Lord of the Rings seven years later, I took to it so avidly. I was already primed to respond to the fantastic. If Wordsworth had intimations of immortality, I’ve intimations of the uncanny ever since – and, despite some moments of uneasiness, I wouldn’t trade with him if I could.